This Shetland Saker was extensivly refitted in 2016 to high standards. 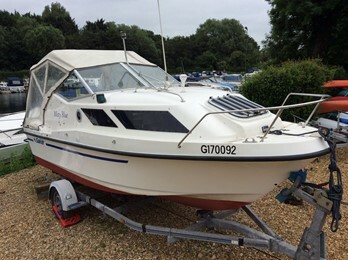 The cabin has been retrimmed, upholstery replaced and the boat generally updated. This Colin Mudie designed cruiser was a more modern replacement for the 535 range and slightly larger although capable of being trailed. The emphasis on coastal performance was greater, the stronger transom could accept up to 115hp outboards. Some petrol inboard versions were also built. 122 of these craft were built. Standing headroom in cabin is 4ft 5ins. Length of V berth 6ft.